Pakistan’s economy is composed of three major components; agriculture, industry and services. Agriculture alone contributes nearly one-fourth of the GDP but in spite of this, the taxation structure of Pakistan is grossly distorted because agriculture sector dominated by the sitting parliamentarians has always been out of tax net. Pakistan’s tax-to-GDP ratio is one of the lowest; very close to 10%. This structural distortion is the major cause of Pakistan’s fiscal crisis. The only way to mobilize the resources is to tax everyone without immunity but since those dodging taxes are sitting in the high-places, the can afford to defy mounting Western pressure to end a giant tax dodge with fewer and fewer people contributing to government coffers, spelling dire consequences for a sagging economy. According to AFP, tax is taboo in Pakistan because barely one percent of the population pays at all, as a corrupt bureaucracy safeguards entrenched interests and guards private wealth, but starves energy, health and education of desperately needed funds. Less than 10 percent of GDP comes from tax revenue — one of the lowest global rates and worse than in much of Africa, say economists. Federal Board of Revenue (FBR) said 1.9 million people paid tax in 2010, less than the year before, despite 3.2 million being registered to pay — itself a drop in the ocean of a population of 180 million. As a result, Pakistan’s fiscal deficit widened from 5.3 percent to 6.3 percent of GDP in 2010, the Asian Development Bank said this month, knocking 2011 growth figures to 2.5 percent and predictions for 2012 to 3.2 percent. In the wake of catastrophic 2010 floods that cost the economy $10 billion, Washington donated hundreds of millions of dollars and demanded that Pakistan’s rich, whose lifestyles outstrip many in the West, step up to the plate. The visiting British Prime Minister David Cameron pressed the point home, saying aid increases were a hard sell when: “Too many of your richest people are getting away without paying much tax at all and that’s not fair”. Tax reform has come to nothing, not least because of political stalemate in the hamstrung parliament and a government coalition threatened with collapse by walk-outs. The IMF last May halted a $11.3 billion assistance package over a lack of progress on reforms, principally on tax. And despite a flurry of meetings, no new loan has been agreed in the run-up to the IMF and World Bank’s Spring meetings. An IMF review mission is due to visit on May 8. Under pressure, the government pushed through a short-term 15 percent flood surcharge on income tax and a 2.5 percent special excise duty in March, but it is uncertain whether they will survive the next budget in June. Government suggestions of raising revenue by reforming a general sales tax ran into walk-outs from politicians who said it unfairly hits the poor. “There’s talk of early elections. One has a brittle coalition. A lot of the reform areas that need to be dealt with have very well entrenched and powerful lobbies that are making the case against it,” said a finance ministry official. As it is, the tiny minority who contribute say they carry a disproportionate tax burden, for which they get nothing in return. Pakistan suffers from an awful energy crisis, yet government spending on electricity subsidies last year reached just under one percent of GDP, health spending 0.5 percent and education two percent, said the finance ministry. According to a 2009 study by the Pakistan Institute of Legislative Development and Transparency, the average member of parliament was worth $900,000 and the wealthiest $37 million. Those figures stand against estimates that a quarter of the population lives below the poverty line and that GDP per capita stands at $2,400. 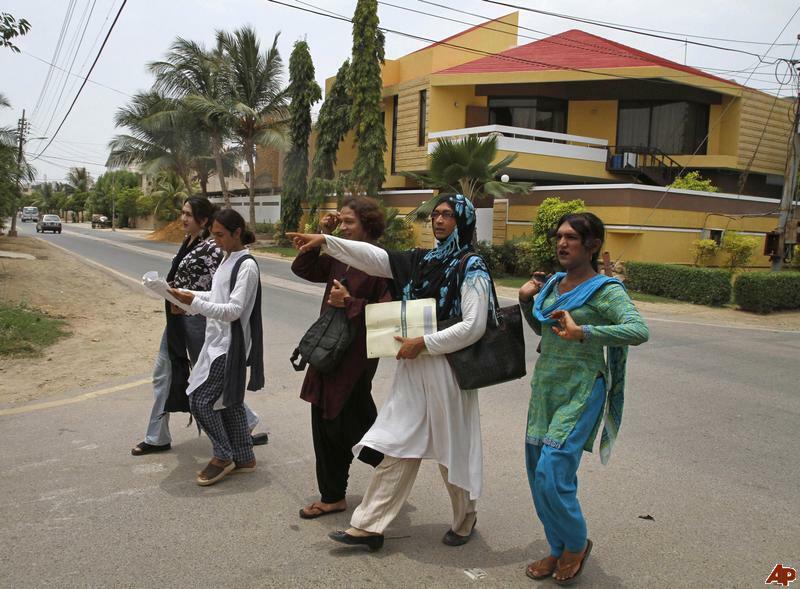 Eunuchs have been appointed tax collectors in Karachi, the financial capital, on the understanding that a visit from the maligned transgender group would embarrass people into paying up. But former finance minister Salman Shah said tax evasion was inevitable because of corruption within the FBR, which employs 23,000 people nationwide. “There’s a big mistrust of the tax authority itself. That’s why a self-assessment scheme came in,” said Shah. Pakistan’s counter-terror fight generates huge injections of aid from the United States, but at a conference last October, Secretary of State Hillary Clinton could not hide her impatience. “Is is absolutely unacceptable for those with means in Pakistan not to be doing their fair share to help their own people while the taxpayer of Europe, the US and other contributing countries are all chipping in to do our part,” she said. Truth was the only casualty in Abbottabad operation….